Furry Friend Friday With Penny! Happy Furry Friend Friday everyone! 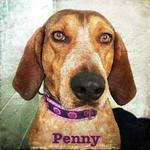 Meet Penny, this three year-old hound is up for adoption through Greyhound Friends, Inc under their “Hound Friends” section. This cutie hasn’t had the easiest life so far, she was picked up as a stray in Kentucky and brought to a shelter there before she was transported up to Massachusetts. She has been with Greyhound Friends for a few months now and is ready for her fur-ever home! Greyhound Friends is also home to Bolt, who I interviewed a few weeks ago. Bolt would be the perfect dog for an older couple or family with young children, read more about him here. So Penny, what is your favorite way to spend the day? Well, as a hound I have a very strong nose and love to use it! Getting outside and out and about is one of my favorite things to do, and I love playing with other dogs as well! I’m a very active girl and have a lot of energy so I need to find a way to burn it off or I’ll go stir-crazy! Do you have a favorite place to go for a walk? Well here at the shelter they have an entire fenced in acre where we can all run around! That’s all I’ve known for the most part since I’ve arrived here in Massachusetts and I’m hoping that once I find my family they will take me on a lot of adventures so I can learn my way around and find all the most happening spots. What about a favorite treat or toy? I LOVE pieces of chicken! That’s by far my favorite snack ever and usually I just get a few small pieces but I would eat a whole rotisserie chicken if I had the chance! In terms of toys, I enjoy playing with frisbees a lot! I’m very quick and some say I would even make a great agility dog! Not really, when I was out on my own on the mean streets of Kentucky I got pretty tough. I had to learn to fend for myself and came across a few scary situations but got through them and now nothing can scare me! What would be the perfect home for you? Well since I am so young and active I would enjoy being with a young couple who likes to go on hikes or runs. I would also love a family with older children that can play with me and goof off, or even a home with another dog to play with. I’m a very good girl and know all of my commands, am house trained, and quite good looking if you ask me! Penny why do you think pet insurance is so important for all pet parents? Well anything can happen in life, which I have seen first hand so it’s better to be prepared for the unexpected! As pets we can’t help ourselves if we become sick so we rely on our owners to take care of us, and sometimes our vet bills can be very expensive so pet insurance can make sure we are protected while saving you tons of dough! Penny is right, pets rely on their owners to get them the help they cannot get for themselves. When you adopt a pet, their health becomes your responsibility, protect them like you would any other family member and call us for a pet insurance quote today! Fourth Of July Festivities In Massachusetts!